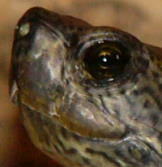 A turtle's eyes and ears. As varied as the turtles themselves. Some eyes are big, colorful and round, while others are dark and sleek. 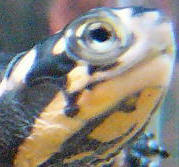 Not only do they let the turtle take in the surroundings, but they also are a looking glass into the turtle's health. 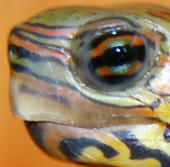 Aside from the shell, Eyes and Ears (although difficult to find in several species) are the most common source of physical medical issues in captivity. Swollen, puffy, bleeding, crusty - you name it, the eyes and ears have it. 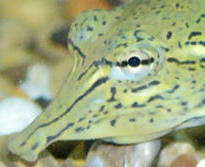 Below, I have discussed a few of the eye and ear problems that are common in captive care. Although some are hard to identify, others leave no doubt. Take urgent care in addressing an eye or ear problem. Also keep in mind that just because there appears to be a problem with the eyes, that does not necessarily mean there is an eye problem. Read on to learn more. A turtle with puffy, swollen or closed eyes is not uncommon and something that you should familiarize yourself with treating. The first step is to determine what is causing the problem with the eyes. If the turtle is experiencing problems with a single eye, it is most likely due to an injury, be it self-inflicted, scraped or poked by another turtle or possible done by something in the habitat (corner of the basking area, stick, etc). If both eyes are affected then, then you need to look into health-related problems. 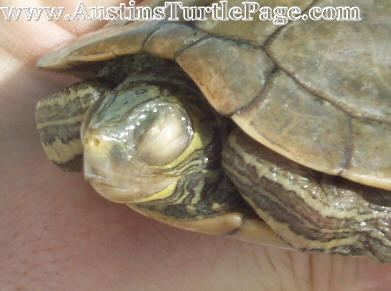 One of the most common causes for turtles to have swollen, puffy, closed or red eyes, is related to water quality. In some species, a high concentration to chlorine can cause them to have adverse reactions. 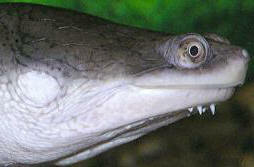 Typically, this is confined to keeping the eyes closed, some rubbing of the eyes and maybe some twitching of the head. This usually goes away within a few hours if left alone. If you notice that your turtle does have a reaction to chlorinated water, either dechlorinate the water before placing the turtle in the water, or let the water stand for about 24 hours before introducing the turtle. If the turtle is having a reaction to water quality, then the first thing you are going to need to look at is your filtration. The filter might be clogged or is unable to meet the demands and a larger or otherwise better filter may be needed to assist in improving the quality of the water. 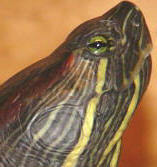 Frequent water changes would benefit your turtle and would assist you in determining if this is indeed the problem. Vitamin A deficiency is another common problem. If your turtle is not eating a varied diet which is rich in vitamins or is not being offered a supplement, then this may very well be the problem your turtle is having. 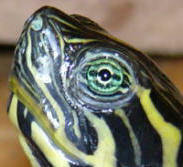 If your turtle has an infection of the eyes, then prompt attention is needed. Keep in mind that not all eye infections are actually problems within the eye itself. It may also be in an infection within the body and is simply manifesting itself in the eyes in the appearance of swelling. If the problem lies in a scratch from another turtle, there really is nothing you can do to prevent it from happening again because these things happen. As for treating it, the best way to is to apply some human eye medication 2 times a day. Make sure that this medication does not contain any steroids. If unsure, consult the pharmacist where the ointment is sold. Keep the turtle dry for about 30 minutes after medicating and then return to a hospital / quarantine tank which has clean water. Clean water is important to avoid any other complications with the eye. In the event the eye does not get better, then it may be possible that either complications have set in or that your initial diagnosis of the problem being another turtle's claws were incorrect. In either case, you would then need to consult a qualified veterinarian and get the necessary medications. Even though you may be feeding what they would normally get in the wild, there may still be some problems. Like with all other animals, there are those that have problems in some ways no matter what. Increasing the Vitamin A intake (by use of diets high in Vitamin A or supplements) is needed. If the turtle is in bad shape, then a trip to the vet for a vitamin injection might be in order. If this is the case, then the turtle may also be deprived of other minerals and vitamins, and a serious revamping of the diet is needed. 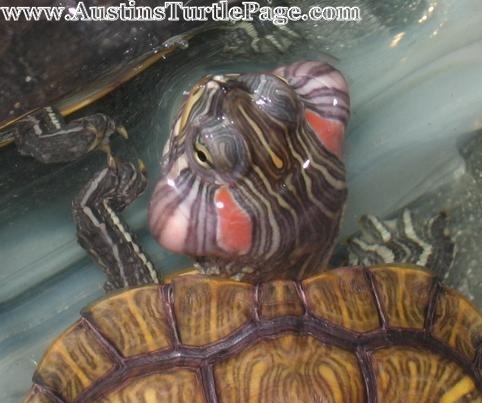 I do not recommend the use of Vitamin A drops, as Vitamin A in high doses is toxic and can kill your turtle. 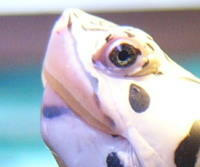 If your turtle is experiencing the eye problems and you are certain the diet is packed with all the necessary vitamins and nutrients a turtle needs and it has not been accidentally scratched by another turtle, then it is most likely a bacterial infection, either in the eye itself or an infection in the body that is manifesting itself in the eye. For this, it is important to seek a qualified vet as soon as possible. The vet will most likely give you antibiotics, but ensure that you maintain the turtle in a quarantine tank with clean water and it would not be a bad idea to use eye-meds for the turtle either. Again, make sure the eye ointment contains no steroids. 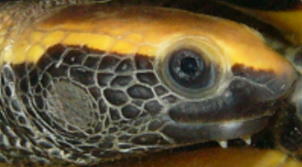 If your turtle suddenly has blood inside the eyeball itself, there is really not much that can be done, except to help the turtle in keep the eye clean. Eye ointment is not a bad idea, but it will only help in keeping bacteria from infecting it. Most oft times, this will heal on its own. A trip to the vet might not be such a bad idea. I have had only one incident in my collection of this. It was a new hatchling Mississippi Map Turtle. After a week and a half, the problem has healed itself and there have been no side effects since. 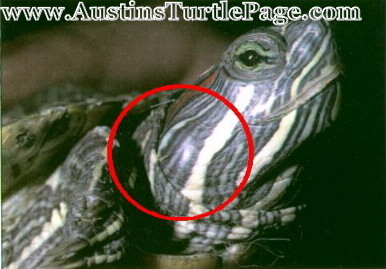 Lumps appearing on either side of the turtle's head - oftentimes both sides - is a sure sign of an ear abscess. This does not mean that you are doing anything wrong with your habitat or your care. Just like with people, sometimes bacteria enters the body and there is nothing that can be done to prevent it. Don't feel like you have done something wrong, because you most likely haven't...just get it taken care of. Treatment usually consists of nothing more than a simple trip to the vet, though some have done it at home. The typical reason for this is water quality (in aquatics) and humidity and temperature conditions (in terrestrial species). Oral and systemic meds are most times useless at treating this type of infection and an incision over the infection is required. 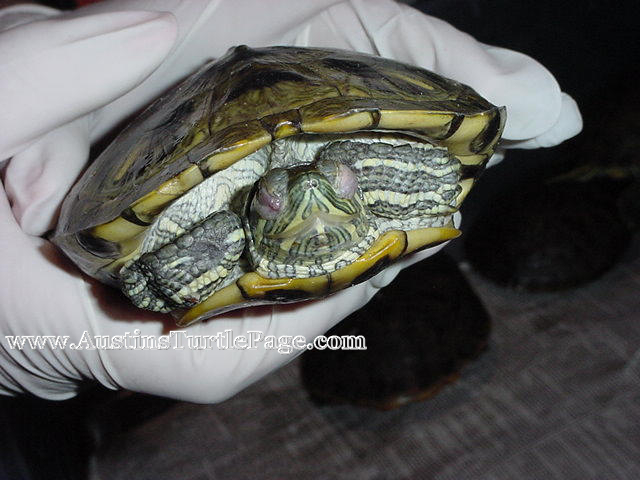 Although this can be done at home, it is recommended that a vet is utilized as there is pain involved for the turtle and an anesthesia is preferred. 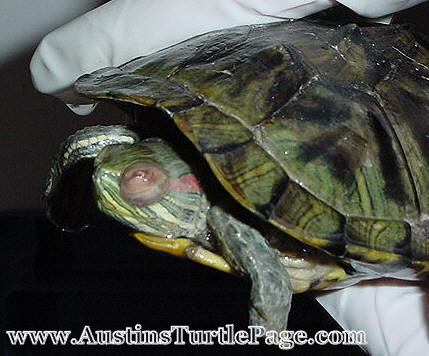 Most times, the vet will place the turtle under anesthesia and make an incision along the lump. The vet will drain the infected area and then rinse the area, ensuring that all of the material is removed. If the infection has solidified, then the vet will need to remove the hard clump-like material in addition to the fluid build-up and then flush with a cleansing solution.